Love creamy pasta sauces but not all the saturated fat and calories that come with most recipes? 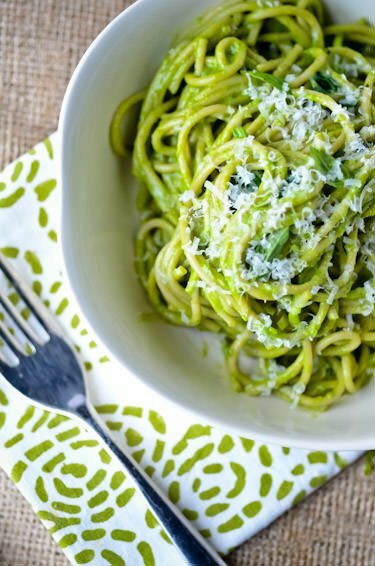 If you love avocados and pasta then this is the dish for you. And while this dish is not exactly low in calories, it’s full of monounsaturated fat which in studies have found to lower cholesterol and it is thought to prevent inflammation. Avocados are also loaded with 20 vitamins and minerals including vitamin E, vitamin C, folate, fiber, iron and potassium, plus they taste amazing. This is a perfect weeknight dinner for when you want something on the table fast. 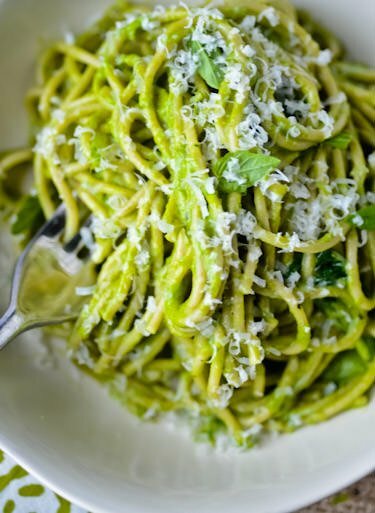 Avocado, paired with lime, garlic, basil makes for the richest, creamiest most delicious pasta ever. Bring a large pot of salted water to a boil over high heat. Add the pasta and cook until tender but still al dente 9 -11 minutes. Drain and reserve 1 cup of the cooking water. While the pasta is cooking make the avocado sauce. Using a spoon, scoop out the flesh from the avocado and place in a food processor or high-speed blender. Add the basil, lime juice, zest, garlic, jalapeno, basil, spinach, salt and pepper. Blend until smooth. Pour the sauce over the pasta and toss everything together adding a little cooking water to loosen the sauce as needed. Top with the grated parmesan and basil and serve.